In a world that doesn't seem to be too far into the future, global warming has melted the ice caps and most of the coastal world is now underwater. This wasn't such a big deal for Lucy at first, since she was fine in her New Jersey town, but three years later an even deadlier enemy claimed 99% of the population of the planet: the plague. Lucy somehow managed to survive without contracting the disease at all, but her family was not so lucky. After a year of wilderness survival on her own in the Wilds of what used to be Central Park, Lucy finally finds a group of people who she might be able to live with. But she could spell the end for them all; there is something about her that makes her very valuable to those who are barely holding on to power. While reading Ashes, Ashes, I often found myself thinking how awful the lives these people led sounded. I was very creeped out during the beginning of the book, when Lucy was still on her own, but I kept flipping the pages, eager to discover Lucy's past and what would happen next. I didn't find out much as far as back story, unfortunately. We learn that Lucy is largely unremarkable, with no special talents other than survival. I can tell there is more to her, but I never found her history besides brief flashes of memory, which was disappointing for me. The same is true for the secondary characters in this book—we get clues, but no real stories. What didn't disappoint was the action. There was a lot of it, and Lucy was nearly always at the center of it. I was compelled to find out the mysteries behind the Sweepers, what I'm assuming are government officials who kidnap survivors of the plague. Those kidnapped are never seen again. And when Lucy becomes their target, I wanted to know what made her special. The next part might be a bit spoilery, just a warning. We never really get the answers to the burning questions in the book, kind of a letdown, especially when much of the book focuses on this aspect of Lucy and how the Sweepers are after her for some reason. I'm guessing there will be a sequel to answer some of these questions. Overall, I don't feel strongly about this book one way or the other. It provided entertainment while I was reading and did give me something to think about as far as how the way we are treating our planet might turn out, but I don't think the story or the characters will stay with me too long afterward. 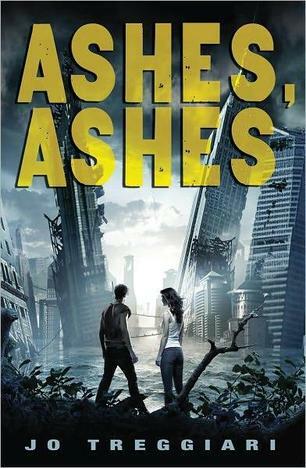 If a sequel does come out, I will most likely pick it up to find out the secrets behind the characters and the government that were left unrevealed in Ashes, Ashes. Disclosure: I received an ARC from the publisher at one of their events. I DNF this book. I, too, was waiting for a back story and my patience ran out. And that you mention we don't get answers to burning questions, well that reassures me that I did the right thing by putting this book down. It just wasn't the book for me. Thanks everyone! I am hoping there will be a sequel. I think the story has a lot of potential, but it just hasn't been realized yet. I'm guessing there will be, considering how difficult it is to publish a single volume in YA right now. Top Ten Tuesday made the shortlist for BBAW! !